Child Nutrition and Early Intervention This is an early intervention project based in the slums and squatter colonies of Calcutta. Since maximum brain development occurs in the first 2-1/2 years after conception, any investment made in the child’s health and brain development during this crucial window will reap rich rewards later. This project provides crucial prenatal care to pregnant mothers, monitors deliveries, and then monitors the health of the child for two years after birth. Such an early intervention plan provides under-privileged mothers with a reasonable guarantee that their baby will grow into a healthy adult. Such intervention therefore helps reduce the population growth rate as well, since (as is widely accepted) most women who are reasonably sure that their baby will grow up healthy will naturally want to have fewer babies, in spite of any cultural pressures to have more children. (Such women, it is accepted, will typically be proactive about family planning,no matter what their economic status, and importantly, no matter what their husbands may insist.) Health workers track the pregnant mother on a regular basis, providing advice, and monitoring the pregnancy. They ensure that the mother gets her nutritional supplements (iron in particular), and gets her crucial sixth month shots. They ensure that the mother is examined regularly by qualified doctors, and that at-risk deliveries are performed in equipped hospitals. They ensure that the newly born baby gets its inoculation, and that its nutritional inputs are balanced after weaning. They advise the mothers (and their families) about hygiene, about child spacing, and the importance of education. This project is run by CINI (Child in Need Insitute). 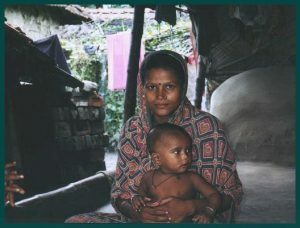 CVI has sponsored hundreds of mother-child pairs over the years.